The great Clan Kerr Is well remembered in Scotland as one of the most loyal but warlike Clans of the turbulent Border territories. The name is of ancient origin, stemming back to the Norse settlement of Normandy where the Kerrs were an important family. The name Itself derives from the old Norse "kjrr” meaning "men from the marshes”, and the name has been spelled In many forms since, including Kerr, Ker, Carr and Carre. Another variant is found on the west coast of Scotland, particularly on the Isle of Arran, taken from the Gaelic "Ciar", meaning "dusky". There appears to be no known connection between the two oral traditions. Almost all Kerrs and their spets assert connection to the Norman tradition. The Kerrs arrived In Britain after William I's conquest of England In 1066, and family tradition asserts the Norman origin for the chiefs comes from two brothers, Ralph and Robert (also called John) Ker, who came from Lancashire and settled in Jedburgh around 1330. 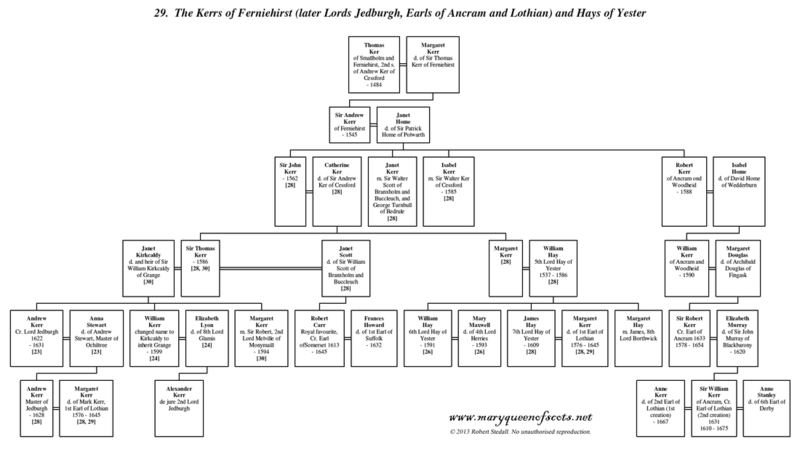 It has never been confirmed who was the elder, although the senior branch of the family, the Kerrs of Ferniehirst claim descent from Ralph, while their rivals, the Kerrs of Cessford, descended from John. The Clan soon grew and prospered, building themselves a position of Influence through their sheer strength and tenacity. The Clan Kerr controlled two castles on the border with England, and were quick to fend off any Intrusion by the Southerners, but were not too indisposed to a quick venture across the divide whenever they fancied some prime English beef for their tables. Rival Scottish border clans included Clan Heron and Clan Scott. ​By the 15th Century the Clan Kerr were considered highly Important Crown vassals, and with loyalty came rich rewards. In 1451 Andrew Kerr was granted the barony of Old Roxburgh, and by 1457 had been created the Warden of the Marches. By the close of the 15th Century, the Clan Kerr held the honours of possessing the Castle and Barony of Cessford, and the Barony of Oxnam, a considerable achievement for any Border Clan. The Kerrs were often at feud with other Scottish boarder clans including Clan Scott and Clan Heron. They would meet for battle at a place called Bellendean. The feuding would cost the lives of both the Clan Kerr and Clan Scott Chiefs. The Ferniehirst and Cessford branches often feuded with each other. However, both Andrew Kerr of Ferniehirst and Andrew Kerr of Cessford were made Wardens of the Middle March, the first in 1502 and the latter after the Battle of Flodden in 1513. After the Battle of Flodden Field, some of the Liddesdale clans put themselves under the protection of the Kerr of Ferniehirst, but, in 1523, the Ferniehirst Castle was taken by the English after a bold and protracted defence. During the Anglo-Scottish Wars, Clan Kerr fought against the English at the Battle of Flodden Field in 1513. A few years before the Battle of Flodden Field, three Englishmen killed Sir Robert Kerr, a former Warden of the Middle March, while he was attending a march across the Border, and his son tracked down one of the murderers and gave him what was known as "Jeddart justice". The Clan Kerr's faithfulness to the Crown of Scotland continued throughout the centuries, and the Clan was always willing to take up arms for the sake of their proud nation. The Kerrs fought under their chief, Sir Andrew Kerr, at the Battle of Flodden Field in 1513, standing beside King James IV of Scotland In his conflict with the English armies. Thirteen years after the Battle of Flodden Field, Sir Andrew laid down his life in defence of the Infant King James V of Scotland when the royal procession was attacked on the way to Edinburgh Castle. With such sacrifice came great rewards for the Clan Kerr. The Clan Kerr feuded in particular with the Clan Scott. The feud began on the 25 July 1526, when The Chief Kerr of Cessford, who had worked as Warden for peace and co-operation with England, was killed by a follower of Clan Scott of Buccleuch. Sir Walter Scott of Buccleuch launched an attack (the Battle of Melrose) to rescue the young James V of Scotland who was being held by the Douglas Earl of Angus at Darnick just west of Melrose, and in the ensuing fight, Andrew Kerr of Cessford was killed. The feud between the Clan Scott and Clan Kerr continued. The Kerrs of Cessford took their time and, in 1552, they set upon Sir Walter Scott, the Chief of Clan Scott of Buccleuch, on Edinburgh High Street and killed him. The feud came to an end when Sir Thomas Kerr of Ferniehirst married Janet Scott who was the sister of the tenth Scott Laird of Buccleuch and a peace agreement was signed in 1602. For loyalty to Scotland, honours continued to be heaped upon the Clan down through the years, with the titles bestowed on the Kerrs including the Barony of Newbattle, the Earldom or Lothian, the Lordship of Jedburgh, the Earldom of Ancram, and the Dukedom of Roxburghe. In 1606, Mark Kerr was decreed the Earl of Lothian. This title failed when his son died in 1624 without male issue. In 1621, Sir Andrew Kerr of Ferniehirst was decreed Lord Jedburgh. The third peerage to come to the family was the earldom of Ancram, which was given to Sir Robert Kerr, a descendant of a younger son of Sir Andrew Kerr of Ferniehirst. In 1616, Sir Robert Ker of Cessford, by this time spelt his surname with a single ‘r’, was created Earl of Roxburghe. In 1631, Sir William Kerr, son of the Earl of Ancram, was granted a new earldom of Lothian in 1631. His son was Robert Kerr who was advanced to the rank of Marquess and who also succeeded to the earldom of Ancram on the death of his uncle. Lord Mark Kerr, son of the Chief Marquess of Lothian, was a distinguished professional soldier and is reputed to have had a high sense of personal honour and a quick temper. He fought several duels throughout his military career but rose ultimately to the rank of general, and was appointed governor of Edinburgh Castle in 1745. During the Jacobite Uprisings of 1745, the Clan Kerr supported the government side. At the Battle of Culloden in 1746 Lord Robert Kerr who was captain of the grenadiers In Barrel's regiment, received the first charging Cameron on the point of his Spontoon, but then a second cut him through the head to chin. He has the dubious distinction of being the only person of high rank killed on the government side. The eldest of the brothers, Mark, Lord Kerr, later the fourth Marquess of Lothian, commanded three squadrons of government cavalry at the Battle of Culloden and survived to serve under the Duke of Cumberland in France in 1758. The Earls of Lothian were advanced to the rank of Marquess at the beginning of the 18th Century. The 12th Marquess of Lothian resides at Ferniehirst Castle, although the principal seat of Clan Kerr Is considered to be the fabulous mansion of Monteviot. Other great monuments to the Kerr's success are the splendid Floors Castle, and Newbattle Abbey, near Edinburgh.